Nothing much doing on the poll aggregate, but two ReachTEL seat polls provide further evidence of the Coalition’s low ebb in Victoria. The BludgerTrack poll aggregate shifts negligibly in favour of the Coalition, who have picked up one on the seat aggregate in South Australia. I won’t be bothering with the leadership ratings until the new year recess, as some fairly heavy reupholstering is required to integrate Scott Morrison’s data into the code. Two ReachTEL electorate polls have lately emerged from Victoria, recording swings approaching or exceeding double digits against the Liberals – with the caveat that both appear to have identified the names of the parties rather than the candidates. • In Corangamite, held for the Liberals by Sarah Henderson on a post-redistribution margin of exactly nothing, a poll for the Geelong Advertiser gives Labor what I calculate to be a lead of 59-41, based on 2016 election preferences. The Advertiser’s report has it at 52.1-47.9, but this credits Labor with no preferences whatsoever from “other/independent”, when they in fact scored slightly over half of them in 2016. After excluding the 4.6% undecided from the poll, the primary votes are Labor 42.8%, Liberal 33.7% and Greens 11.7%. I don’t know exactly when the poll was conducted, but the sample was 856. • The Herald Sun reported last week that a poll for the CFMEU found Kelly O’Dwyer, who holds Higgins on a post-redistribution margin of 10.3%, trailing Labor by 53-47. Primary votes of Liberal 38.6%, Labor 32.5% and Greens 18.8% are provided, which I presume does not exclude an undecided component. Did you know Beverly Broadbent? C’mon Rex and nath, what would the numbers be without Bill? With parliament not due to return until February next year ahead of an April 2 budget and a likely election mid-May, Scott Morrison has maintained his lead over Bill Shorten in the leadership contest. Approval ratings for both leaders dropped in the wake of a chaotic final week of parliament with Mr Morrison’s satisfaction rating dropping a point to 42 per while those dissatisfied with him rose three points to 45 per cent. Mr Shorten also fell a point with an approval rating of 36 per cent and one point rise in those unhappy with his performance as leader. 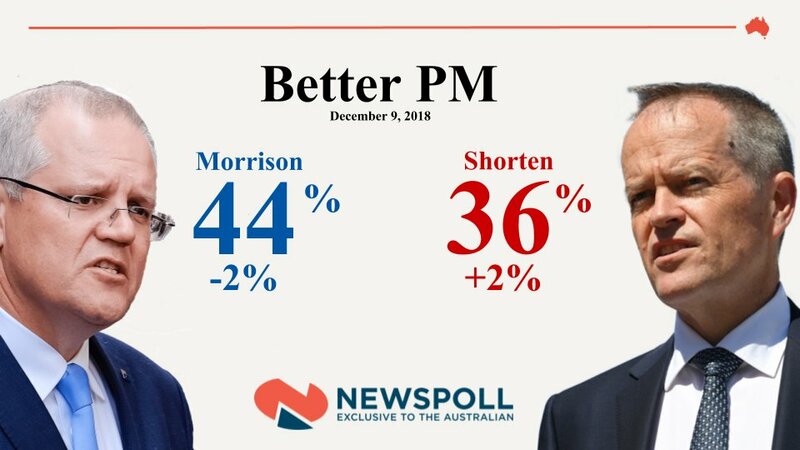 Mr Shorten however managed to close the gap on Mr Morrison’s lead as preferred prime minister gaining two points to 36 per cent while the Liberal leader dropped two points to 44 per cent. What a stupid question asking Swan if he is in touch with the labor membership ! It was the labor membership that voted him in a president over that left wing hypocrite Butler. BTW, it would be interesting to see the breakdown of the liberal / national vote. Would not surprise if the increase in coalition primary came from the nats. Those are the explanatory notes. Read the actual legislation, and search for “particular person”. You’re correct, I was looking at the notes/memo. However my read of the legislation doesn’t say that a TCN must target a particular person. The only way “particular person” gets into the TCN section is transitively, via “systemic vulnerability” and “systemic weakness”, which are things a TCN may not order. And it’s even transitive in those sections, as the test that allows you to order “systemic vulnerabilities” and “systemic weaknesses” anyways isn’t “does this order relate to a particular person”, it’s “does this order target technologies likely to be used by a particular person”. Which would at a minimum allow you to order the spyware version deployed to everyone but left dormant on each device until it received some flag from the operator’s server (which might be sent when logging in or syncing data). And if you’re using a TCN to order anything that can’t be considered a systemic vulnerability/weakness, the ‘particular person’ test (weak as it is) does not seem to enter into it at all. The checks-and-balances here seem way out of whack (or deliberately toothless). Without Shorten it would be 59-41 for sure. Pauline Hanson and Greens almost even on Primaries. Might be even come Election Day. The Greens have seriously dropped the ball as a genuine 3rd party alternative, and the country is poorer for it. When they stop obsessing about Labor and their own virtue signalling, only to have it blow up in their faces via allegations of misogynistic internal culture, they should get back to their core business: the environment. Playing politics hasn’t served them well either. Only 8 points now PPM so no cheer for Murdoch at all. looks like they have locked in 55; to get a 57 they are going to have to change leaders again. Abbott could do it. P1, you said earlier there is no point in the Greens criticising Coalition policy, because they would have zero influence over them and they know it (or wtte). Influencing the behaviour of the person or group you are criticising is not the only purpose you can achieve in doing so. You could also influence the attitudes of third parties towards the target of your criticism. In the realm of politics, if the Greens devote 90% of their time to criticising Labor and only 10% to criticising the Coalition, third parties (voters) will receive 9 times as much negative framing of Labor from the Greens as they receive of the Coalition. This is more likely to result in worsening public views of Labor than of the Coalition. On an issue such as the aa bill, this is quite unfair on Labor, since this law was crafted and enthusiastically pushed through Parliament by the Coalition, who are the real villains here. OTOH, Labor were put under political duress to pass it, on pain of receiving 2001 rhetorical treatment in the event of anything going tragically wrong over the summer, whether caused by the lack of this law or (more likely) not. Sooooo which will it be ? The Coalition improves after the summer break as out of sight out of mind fades memory of their awfulness orwill the summer break allow attitudes to the Coalition to set rock hard ? Tones used to do very well out of being hidden from the public for a while . Here’s a headline from the Guardian that Sprocket can bounce off..
For the Coalition? I know that Shorten is a terrific leader, but I think the team behind him can easily keep Labor ahead. Hello Rex, why are you pretending to be nath ? Delusion and help from the Greens? Funny that the Greens seem to be acting like the next election result is a cert? ALP to win and need the Greens cooperation to govern. Their version of responsibility free nirvana. You left out option 3: Morrison Ad Man decides to use the summer holidays as an opportunity to do his Eddie Everywhere impersonation, and pops up ad nauseum all over the place. That is certainly not going to improve his, or his party’s standing with voters. The more voters see of Morrison, the less they are liking him. He may have been scared off that cunning plan by the Qld. bus effort. Not sure a pollie being Eddy Everywhere over summer would go down well. With no Shorten I guess it would be 70-30 to Labor………………….Shoot for the stars I say! Rudd managed 60-40 for a short while so clearly he was the best leader Labor ever had…………..
My timid 54-46 was just that………………………However, with no parliament and the festive season about to hit us, what with goodwill and spirit and all that the LNP might pick up a couple of points just to sheer inertia……. Anyone know if a LOTO has ever had a higher PPM rating than an incumbent PM?? What’s The Black Wiggles Approval rating? Preferred PM?? No. Don’t think so. The bus is fired up and ready to go. As others will point out, the PM will have better PM by default, thus will have larger lead. As the Newspoll is unchanged I wonder if they are polling just marginals still? Does anyone know if the random sample does that or is it truly random across the whole country? I only ask because of suggestions polling did not indicate the Victorian result by not polling safe Liberal electorates. OK. Back from a lovely evening with friends. And what awaits? A Newspoll! So, here is the guess list. PB guessers pat yourselves on the back! I was living in WA for most of that time. Well of course, but Morrison gives every appearance of being committed to his busy, busy, busy, go, go, go schtick that one can see him emulating this over summer. Go early Scott, go early. So ‘people that know him’ have been saying. He doesn’t lack for energy they say. I think what he does lack is political nous. Bill Shorten has it all over Morrison in that respect. I reckon if Morrison keeps getting pictured in pubs all over the place, people might get the impression he’s a bit of a dipsomaniac. The language is tricky. It is the reverse of what you might expect. First it tells you what may not be done (e.g. introduce a “systemic vulnerability”). Then it tells you what would allow this restriction to be relaxed (i.e. if it is targeted at a “particular person”). Not quite. It could only be deployed if it can only ever be activated for a “particular person”. It cannot be deployed if it could be activated for anyone. There is no doubt this is bad legislation. But there is also no doubt what it is trying to “allow”. Leadership klaxon again. “Do not underestimate the sense of responsibility I feel for Brexit…There is a real alternative”. I’m sure that the RWNJ MPs are happy with these figures. They know that, when the party plunges into the vat of electoral fire, God will save the righteous and destroy the bedwetters. The party will be purged and they will all fit into the Monkey Pod room. Normally a democracy can rely on representative institutions to make decisions on behalf of the people. However, there are certain times when direct democracy is appropriate. The UK’s relationship with the EU has significantly high stakes that arouse significantly high passions that justify a direct vote. If there is a second referendum, it needs to include genuine options. Theresa May’s deal with the EU is an option. Crashing out of the EU with no deal is an option. Unilaterally revoking Article 50 and remaining in the EU is an option. The voters deserve the opportunity to rank these three options in order of preference. The most preferred option in aggregate should be the one that is implemented. If the voters choose Theresa May’s deal, this will put a lot of pressure on parliamentarians to enact the voters’ wishes. I think the Remain option would likely to be the most preferred option under current circumstances. Particularly if UK Labour promises that it will ignore the Stability and Growth Pact, use deficits of larger than 3 percent of GDP if this is necessary for full employment with stable prices, and accumulate outstanding treasury securities that are greater than 60 percent of GDP if this is necessary for full employment with stable prices. For this context, full employment means underemployment of zero, hidden unemployment of zero, and unemployment of no more than 2 percent (frictional unemployment). UK Labour should commit to stopping debt issuance. Debt issuance is not operationally necessary; it merely confuses the nature of government spending. The UK has a sweet deal within the EU. It isn’t part of the Eurozone. It isn’t part of the Schengen Area. It can tell the European Commission to pound sand if the Commission isn’t happy with the UK’s performance on the arbitrary and irrelevant Stability and Growth Pact. The UK can model good participation within the EU. The best way to participate in the EU is to enjoy frictionless trade and relatively frictionless travel, but to ignore the absurd rules about deficits, public debt, competition, public procurement, and state aid. If the major members unite behind these objectives, the European Commission will be powerless to do anything about it. Spain, Italy, and the UK can form a sensible alliance that forces the EU to become economically literate and reasonable. Germany will just have to adjust.